Salar de Uyuni and Salar de Coipasa are salt pans or playas in southwestern Bolivia that lie on the central Andean Altiplano at an altitude of over 3600 m. More than 75 playas exist in closed basins, making the Altiplano the largest basin of interior drainage in South America. However, Salar de Uyuni is by far the largest of these playas and is considered the largest playa in the world with an area of 9000 km2 (Rettig et al., 1980). This Landsat color image covers the southern part of the Altiplano Massif, a structurally depressed basin. It is bordered on the west by the Cordillera Occidental, a plateau located mainly in Chile that is comprised of Tertiary and Quaternary volcanics. To the east of the Altiplano is the Cordillera Oriental, a complexly folded and faulted stack of Phanerozoic sediments interlaced by subsequent intrusive. Northeast of the image, the Cordillera Oriental in Bolivia, known for its tin deposits, produces more than 16 percent of the world´s tin (Kidron and Segal, 1981). The Altiplano salars, in this image and south beyond the image, are partially filled with alluvial and glacial debris and are underlain by Tertiary and Quaternary rhyolitic ashflow tuffs (Figure KL-13.1). Numerous volcanoes can be identified (Figure KL-13.2), some attaining altitudes greater than 5300 m above sea level, such as Cerro Tumapa (see index map). To the south, a number of volcanoes rise more than 6000 m above sea level. 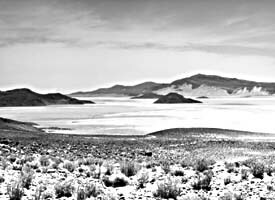 The image area is semiarid, with an average annual rainfall of about 300 mm. Thick deposits of evaporites suggest that this aridity has prevailed for several thousand years. 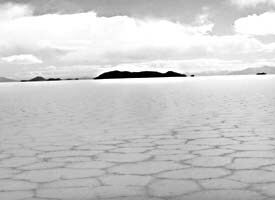 The Salar de Uyuni is thought to have been a closed basin for the last 10 000 years or since the last glacial stage (Rettig et al., 1980). At present, the only water inflow is from the Rio Grande de Lipez and from some small drainages to the east. At higher lake levels in the past, water from Salar de Coipasa, which is about 7 m higher, flowed into Salar de Uyuni. During the rainy season from December to March, the playas maybe covered with brine to depths of 25 cm; however, during the dry season, the brine evaporates to a position at or below the surface. The surface is an evaporite crust of predominantly halite that is very porous and 10 m thick in some places. The repeated wet/dry cycles have produced an exceptionally smooth surface with a relief measured in centimeters (Figure KL-13.3). During the Late Pleistocene, most of the image area was drowned under a huge lake, called Lago Minchin, with a surface area probably exceeding 43 000 km2. This lake was the more southern of the two lakes known to exist then on the Altiplano Plateau. The northern lake, Lake Ballivian, included the present- day Lake Titicaca (see Plate KL-15). The southern lake finally diminished in size toward the end of the Pleistocene (15 000 years B.P.) from 3760 m above sea level to 3720 m about 10 000 years B.P. As the lake shrunk in size, large quantities of calcium carbonate were deposited to form marginal algal limestones. These limestones form terraces that mark the high lake levels (Ericksen et al., 1978). The present elevation of Salar De Uyuni at 3653 m indicates that lake depths well over 100 m were attained during maximum lake size. 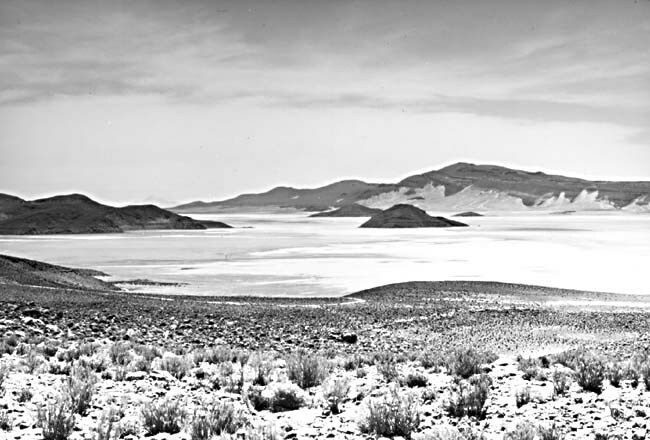 As the calcium carbonate was removed from the lake, the remaining water became progressively enriched in the more soluble saline components like chloride and sulfate. 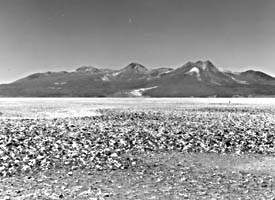 The resulting evaporites were concentrated with gypsum and finally halite, forming a zoned gypsum-halite crust (Ericksen et al., 1978). 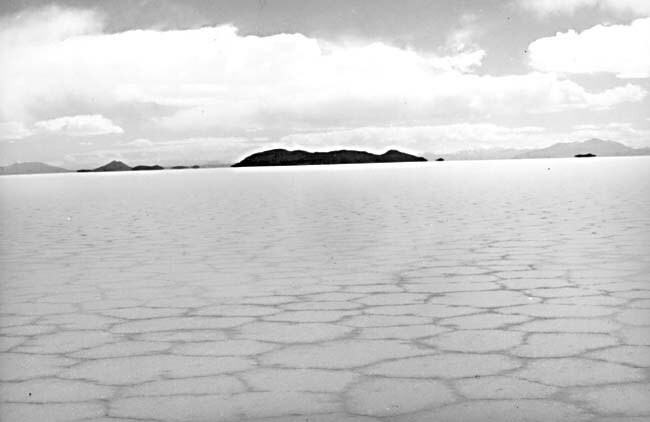 In the last few years, the southern Salar de Uyuni brines have been found to contain anomalous concentrations of lithium from 200 to 2000 ppm (Rettig et al., 1980). 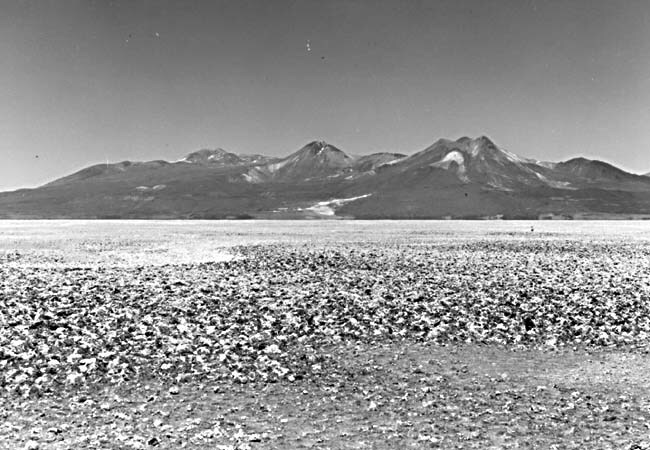 The source of the lithium is apparently derived from the drainage area of the Rio Grande de Lipez, which feeds into the playa. For many years, the playa has been the singular source of salt for Bolivia. More information on distribution of the salts in the salar is expressed in a color-ratio enhancement (4/5 = blue; 5/ 6 = green; 6/7= red) of the subscene shown as Figure KL-13.4. Landsat 1243-13595, March 23, 1973.